Epiphone has made a name for itself by producing some of the greatest and most innovative musical instruments for over 135 years. While models such as Masterbilts, Broadways, Wilshires, Coronets, Emperors and Texans are some of Epiphone's most memorable models, the Casino is arguably our most famous due to its close association with The Beatles. The "Inspired by" John Lennon Casino and the “Revolution” Casino offer professional musicians the same key features of John Lennon’s personal Epiphone Casino that he purchased in London in 1965. Our “Inspired by John Lennon Casino’s cover both incarnations of one of John’s favorite guitars, the Vintage Sunburst (used on The Beatles final tour in 1966 and for the classic albums Revolver and Sgt. Pepper’s Lonely Hearts Club Band and the stripped down “Revolution” version John used for The Beatles White Album, Abbey Road, the rooftop concert for the Let It Be film, and his first solo work with the Plastic Ono Band. As with all Epiphone Lennon guitars, a portion of the proceeds from the sale of each goes to the BMI Foundation for the John Lennon Scholarship Fund which supports music education. 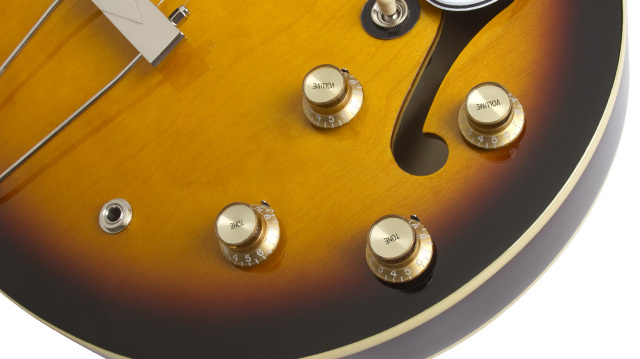 All Epiphones come with the peace of mind you get from a Limited Lifetime Warranty backed by Gibson Musical Instruments famous 24/7/365 day Customer Service. Make your own Revolution today with a John Lennon “Inspired by” Epiphone Casino. For the Epiphone Company of 1961, the Casino was a small breakthrough. After the merger with Gibson in 1957, Epiphone no longer made jazz archtops. A new era of music had arrived. 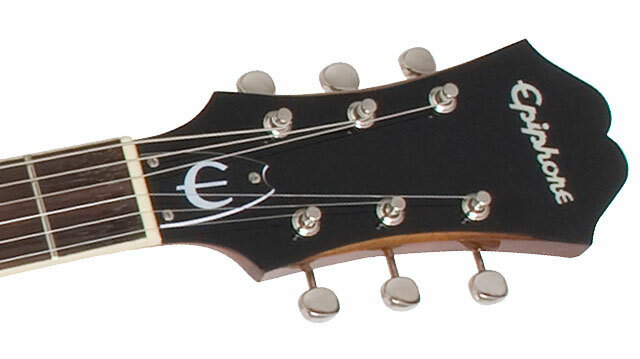 The introduction of the Casino was a modern design that announced that Epiphone’s unique history would continue separate from Gibson’s. Though from a distance the Casino had the look of an ES-335, the Casino was a true hollowbody giving players a clear, ringing tone that could be pushed into overdrive when needed. It was an ideal guitar for stage and studio and can be heard on many landmark recordings including The Beatles’ Sgt. Peppers Lonely Hearts Club Band and The Beach Boys’ Pet Sounds. Maybe it’s purely coincidental that at the same time that the Casino was in its planning stages at Epiphone headquarters in Kalamazoo, Michigan, the Beatles were starting out, too. By 1964, the Beatles were stars and when Paul McCartney went shopping for a new guitar that could feed back, he reached for a Casino. John Lennon and George Harrison soon bought their own and used their Casinos on stage and at Abbey Road throughout the band’s career. The Inspired by John Lennon Vintage Sunburst Casino’s features include a 5-ply maple top, back, and sides with basswood bracing. The 24.75” scale mahogany neck is the classic SlimTaper™ “D” profile with a glued-in neck joint joining the body at the 16th fret, just like the original. The 12” radius neck features a rosewood fingerboard with parallelogram inlays, a 1.625” synthetic bone nut, and for that classic look, small button Grover® tuners. No detail of John’s Vintage Sunburst Casino has been missed and like the original Epiphone Casinos made in Kalamazoo, Michigan, the “Inspired by” models incorporate Gibson USA’s famous P-90T and P-90R dogear pickups for that perfect combination of chime and growl. 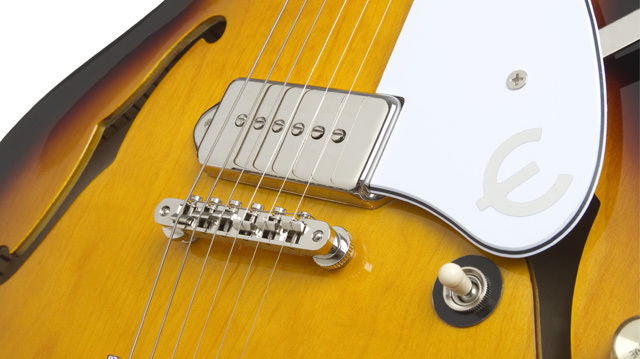 Widely known as the king of single coil pickups, these lean and mean P-90's offer a stellar combination of high output and biting treble response. The P-90 pickups were a favored among jazz players for their clear horn-like tone and were adopted by rock and rollers from the US and the UK who wanted to emulate the R&B records and were also looking for new sounds in the studio. Quality Construction, Hardware and Add-ons! Unlike an ES-335, the Casino is completely hollow which contributes to its unique, signature sound. The Casino has always been known for being an instrument that gets in tune and stays that way, thanks to our Tune-O-Matic bridge and trapeze tailpiece. All hardware is nickel and the Switchcraft™ toggle switch ensures life long security. Both "Inspired by" Casinos include a hard case while the Revolution version also includes the unattached pickguard and mounting bracket.